Stroller Fitness for New Mommies! Home Fit Pregnancy Starts Here – The For Two Fitness Blog Stroller Fitness for New Mommies! Stroller fitness is a great way to bond with baby, get some fresh air, and get your exercise in! Today, Inspired by Family Magazine brings us a guest post. Enjoy these stroller exercises with Alaina Holland – she will take your walk/jog to another level! Focus: Leg toning. Walk with the stroller in front of you with both hands on the handle bars. Take a giant step about 3 feet out with your right leg forward. Kneel downward and explode up while moving left foot to meet the right foot. Do the same with the left foot forward and alternate legs. Between sets rest by walking the stroller forward for about 30 seconds. Keep your abdominals in tight and make sure to not lock your knees during any part of this exercise. REMEMBER: Always keep the front knee behind the front toes and lower straight down. X-TRA: After you lunge forward with your right leg and are exploding up, lift your left leg straight backwards for some extra glute toning before bringing legs together. Focus: Calf toning. Face forward with the stroller in front of you. As you walk step with the right foot and as your feet come together have your right foot go up on tip-toe. Move your left foot forward in step and go up on tip-toe with the left foot. Continue alternating feet in tip-toe motion as you walk. DO: 3 sets of 12-15* on each foot. X-TRA: Stand on one foot while holding on to the stroller in front of you and go up on tip-toe and back down until failure and switch feet. Do 3 sets on each foot. Focus: Whole body toning. Lift left leg straight out behind you as you balance on your right foot. Simultaneously push stroller forward as you lift leg upward. Bend your torso parallel to the ground and put your head between your elbows facing the ground. The end result is a flat table top formed by your body with your leg still raised. Bring the left leg back to the ground as you bring the stroller closer to your body as you move forward. Repeat alternating legs. DO: 3 sets of 6-8* on each leg. X-TRA: Pulse your lifted leg 6-8* times before switching legs. Focus: Leg toning. Place feet wider apart than your shoulders. As hands stay firmly on the handle bars, bend both knees and concentrate on getting your gluteus maximus as far back as possible without falling over. Make sure your knees stay behind your toes as you squat down 90 degrees. Lift up. 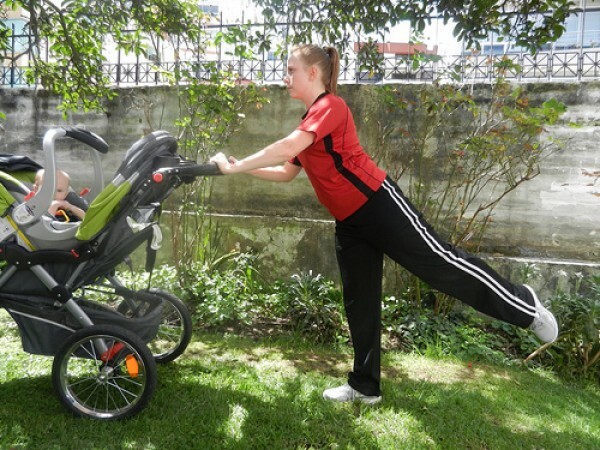 As you stand again pull the stroller in towards your body to add some tricep exercise. DO: 3 sets of 8-12* squats with 30 second rest in between sets by walking. REMEMBER: If your baby is acting up you can also do this in the front of the stroller facing your baby. Baby is usually distracted enough by mom that the problem is temporarily solved. X-TRA: Hold squat 90 degrees for 30 seconds to a minute before lifting up. Focus: Abdominal and leg toning. Stand with the stroller handle on your right side. Put right hand on the handle bar. Left hand curves over your head. Lean towards the stroller with feet together. Bring your hand back. Pull the stroller in with your right hand as your left elbow touches your lifted knee. Return the leg to the ground and bend towards the stroller again while pushing the stroller away from your body. X-TRA: Between knee raises do a leg lift and pulse it up 3 times. Alaina Holland lives in Ecuador. She is a youth mentor, wife, and mother to a sweet baby boy. She holds a Bachelor of Science in Physical Education & Health from Union University and is a Certified Aerobics Instructor with AFAA (Aerobics and Fitness Association of America). She blogs at lorenholland.blogspot.com. You can find more at www.inspiredbyfamilymag.com, Facebook, and Twitter. What are your favorite stroller exercises?